We invite you to meet with the leadership, history and structure of the school, to learn about the latest news and creative achievements of our students, teachers, and many find odnoklassknikov drugoe.Dlya want to start to introduce you to pass the school there are many more answers to your questions. 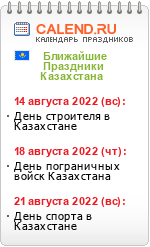 This Charter was developed in accordance with the Constitution of the Republic of Kazakhstan, the Civil Code of the Republic of Kazakhstan, Kazakhstan Resrpubliki Law "On education", Law of the Republic of Kazakhstan "On nekommmercheskih organizations"
В Астане с 25 по 28 февраля прошел XVIII съезд партии Нұр Отан. 31 Jan hosted a round of the Olympiad for the teachers of South-Kazakhstan region.